The JUOMA champions’ KHAN-NA experience! (L-R) Laom, Double A contract farmer; Sharon Lam, Double A Hong Kong Marketing Executive; Mandy Tong, Donald Mok, Kamon Changgep, Double A contract farmer; Peony Hung, Marilyn Au and Thirawit Leetavorn, Double A Senior Executive Vice President. 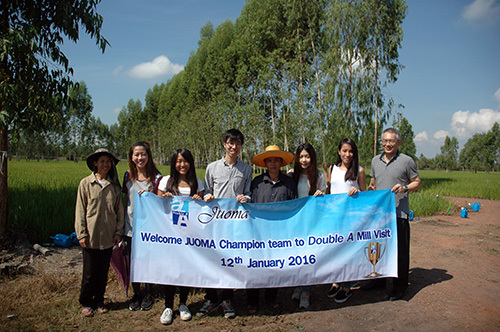 Bangkok, Thailand – The champions of the Joint University Outstanding Marketing Award (JUOMA) 2014-2015 have recently experienced how a sustainable paper is made right at Double A’s integrated pulp and paper mill in Prachinburi, Thailand. The champion team is composed of senior students from City University of Hong Kong, namely, Marilyn Au, Peony Hung, Donald Mok and Mandy Tong. They were welcomed by Double A team headed by Mr. Thirawit Leetavorn, Double A’s Senior Executive Vice President. During the visit, Double A presented its efficient and sustainable resource utilization management under the concept ‘No Waste is Wasted’ through a 4D presentation. Double A highlighted how it turns its wastes from pulping process such as barks, oversized wood chips and black liquor into renewable biomass. Electricity from renewable biomass is used throughout Double A mill, while the excess is sold to the local grid. The students also visited Double A’s research and development laboratory where it breeds its paper trees. To cap the day off, Double A brought the students to a nearby rice field for a first-hand experience of ‘Paper from KHAN-NA’ farmed trees project. Through this unique and sustainable approach, the paper trees are grown along the empty ridges that border the rice field, thus creating economic value from unused land, generating additional income for over 1.5 million Thai farmers, and protecting natural forests. The students had the opportunity to plant paper tree saplings which in 3-5 years will provide the farmer with additional income and Double A with sustainable raw materials. “The mill visit is a comprehensive experience for us to learn about how Double A fully utilize and conserve their energy in the mill and the sophistication and philosophy in making premium quality paper. The KHAN-NA is yet another inspirational practice of gathering raw material which benefits the environment, the farmers and the company”, shared Marilyn Au, the team leader. JUOMA is the leading marketing competition for Hong Kong university students. In 2014-2015, Double A was JUOMA’s sole sponsor under the theme ‘Innovation through paper’. The all-expense-paid trip to Thailand is part of the grand prize which includes a cash prize worth HK$10,000 and a champion’s trophy. © 2011 Double A (1991) Public Co., Ltd. All Right Reserved.